A North East University academic working on ‘wonder material’ Graphene for use in the automotive industry has successfully produced the world’s first prototype composite component. 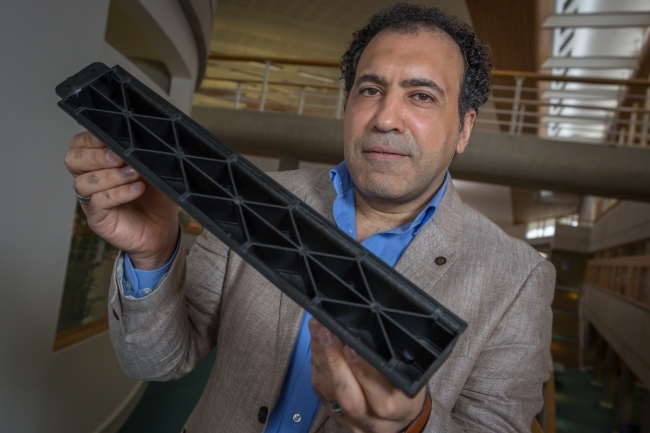 Ahmed Elmarakbi, Professor of Automotive Composites at the University of Sunderland, is leading Task 10.11 – Composites for Automotive, part of the European Commission’s Future and Emerging Technology Flagship. The pioneering project is exploring how Graphene which is just one atom thick and a million times thinner than human hair, could be used to create lighter, stronger, safer and more energy-efficient vehicles revolutionising the global car industry. Sunderland, leading a consortium of five research partners from Italy, Spain and Germany, over the last two years has been conducting a series of tests with support from Centro Ricerche CRF of Fiat Chrysler Automobiles, analysing the properties of Graphene to determine how it behaves when used to enhance the advanced composite materials in vehicle production. Taking the bumper of the car, Graphene was embedded into a polymer and mixed with traditional carbon fibre or glass fibre structural material, which led to changes in its properties, making it lighter, stronger and tougher, allowing the researchers to reduce the thickness of the structural components. Prof Elmarakbi explained: “The results we discovered in the first stages are significant; we achieved a lot more than we ever anticipated. The material is very light and very strong and the impact testing we did showed a 40 per cent higher specific energy absorption than in traditional composite materials. The ultimate prize will be new lightweight components for vehicles which will lead to significantly lower fuel consumption and emissions. However, Prof Elmarakbi says there are still challenges to be overcome. First, there are difficulties in the applying Graphene – which is only a few-layers thick – as the thicker it’s applied the more brittle it becomes, like graphite. Secondly it’s difficult to uniformly disperse the Graphene in the polymer. “Getting the right balance between the Graphene and the polymer is crucial. The composite cannot be too weak, or so strong that it’s unable to absorb energy in the event of a collision. Modern cars are designed to crumple in a crash – protecting the passengers – whereas a composite that is too strong would transfer energy to the car’s passengers, compromising their safety. “We have a very good uniform dispersion now, but it’s not an easy task. We need to make it lightweight and at the same time very safe. “Part of the challenge in reaching this point has been that it’s all new, nothing exists and everything we’re doing is a first. We’ve even had to design the software to simulate the Graphene applications from scratch,” continued Prof Elmarakbi. The Graphene Flagship represents a new form of joint, coordinated research on an unprecedented scale. Forming Europe’s biggest ever research initiative as part of the European Commission’s Future and Emerging Technology Flagship it has a budget of €1 billion. The Graphene Flagship is tasked with generating economic growth, new jobs and new opportunities by bringing together academic and industrial researchers to take Graphene from the realm of academic laboratories into European society in the space of 10 years. The Flagship’s findings have the potential to bring huge changes to the future of product design and manufacture, with research collaborations across Europe focusing on the use of Graphene in five areas – Internet of Things; Wearables & Technology; Datacom; Energy; and Composites. And this research is attracting much interest for sectors, including the highly competitive global automotive market.